Be ready to be mesmerized. That is, if you are ready enough to conquer hours of trekking through hills, untamed shrubs, boulders, unbeaten paths….. The Udlom Falls is a sight so rewarding, the inconveniences of the journey are well worth it. This waterfalls, one of the tallest in Cebu island, is a must for people who find more satisfaction in conquering a challenge. For there is no better word to describe the long and arduous journey on foot through scenic hills. 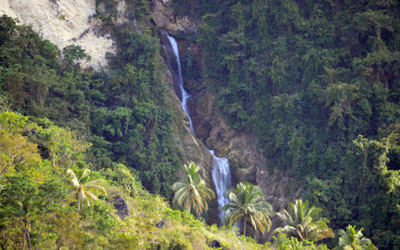 The falls can easily be viewed from the barangay proper of Lamac, the most popular and visited barangay in Pinamungajan outside the Poblacion. Whether you are lazily swimming at one of the pools of the Hidden Valley Resort, or on their zipline or sky bike, or just sitting around, the Udlom Falls is the silent witness to all your fun and laughter as it flows through the mountain walls surrounding the resort. But looking at it from afar may never be enough for the adventure-thirsty souls. Be recharged. Be inspired. Lose yourself in the majestic wonders of a voyage in the wild, for it is also a voyage to oneself, and in return, the trip may gift you with a new find: that of a better, healthier and stronger body and mind. What’s more, there is no entrance fee!